As many of our guests are corporate travellers we provide exclusive services to help you do business. With fast WiFi and easy-access power points in every apartment, our rooms were created with contemporary business needs in mind. 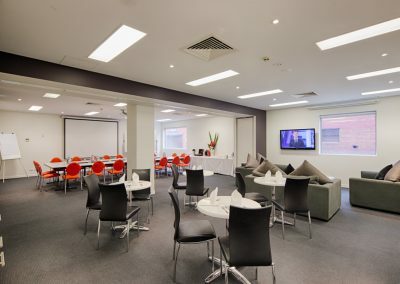 Adara Richmond features a conference room and corporate lounge which can be booked upon request and customised to suit your needs. Adara Richmond can cater for events of all types and sizes. 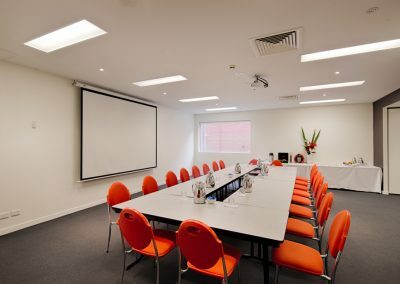 Our large, light-filled conference room can be set up in boardroom, classroom or theatre style, while accommodating up to 70 people. 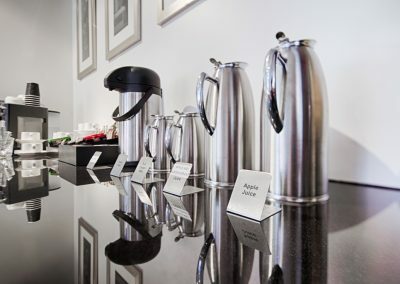 We can assist in your event planning by providing fresh, high-quality catering options and by supplying AV equipment, in addition to the in-room projector and screen, upon request.The lounge features several sofas and a large screen TV, and is the perfect place for sports and business groups to unwind. Getting around is easy when you stay with Adara Richmond. Stroll through the Treasury Gardens, take a short taxi ride, or jump on the 75 or 48 tram to travel into the CBD. Make sure you purchase a Myki public transport card at reception prior to using trains or trams in Melbourne. Reception hours are between 07:00 – 22:00 hrs on Weekdays and 08:00 – 22:00 hrs on weekends Public holidays please contact reception. Late arrival to be organised prior to check-in. Limited parking ( charges apply) Contact reception to confirm availability.